Thinking about how this year has gone thus far and how I want next year to be had me thinking. Also, talking to my clients and some of my friends who are in the midst of major life and career changes made me wonder if others are in this same flow of contemplation and major decision making energy. 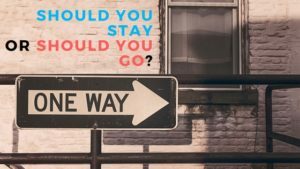 ‘Tis the season to almost be jolly, but you’re stuck in a space of utter frustration and confusion trying to decide whether you should stay or go. You’re grateful, but you’re not really happy. You’re comfortable, but you’re not being challenged. You’re stable, but your growth is being stunted. You reek of stagnation and you are desperate to jump into a bathtub full of bubbly, courageous change water so that you can be successfully cleansed of your STUCK FUNK. Stay Funky or Get Fresh? Who will benefit the most from you staying where you are? Who will suffer the most from you staying where you are? In what ways will staying help you grow, develop, or reach a goal? What immediate impacts would you experience if you go? What new routines or practices would need to be adopted to ensure a successful departure? How is this aligned with your life goals and dreams? If you can be freed from being stuck by staying, changing your attitude, and becoming your own catalyst for change, then there could be plenty of golden opportunities for your growth and success. If you can be freed by going, then make sure you have done all you could do to serve as a positive change agent in the situation. Be who you need to be for your own happiness first. It’s always good to have someone help you see things from a different perspective. In the #WorkLifeDreamsBalance Beginner’s Kit, there is a worksheet that asks you to outline who your dream team members are. It is important to have mentors, coaches, or colleagues who understand where you are and where you want to go. It’s important to have people help push you, constructively criticize you, and hold you accountable for doing what will push you into your excellence, happiness, and success. …or are they possessing you?